System.ValueTuple has a special compiler support and thus allows to define named fields. This is a big advantage comparing to System.Tuple which only has Item1, Item2, ... properties. 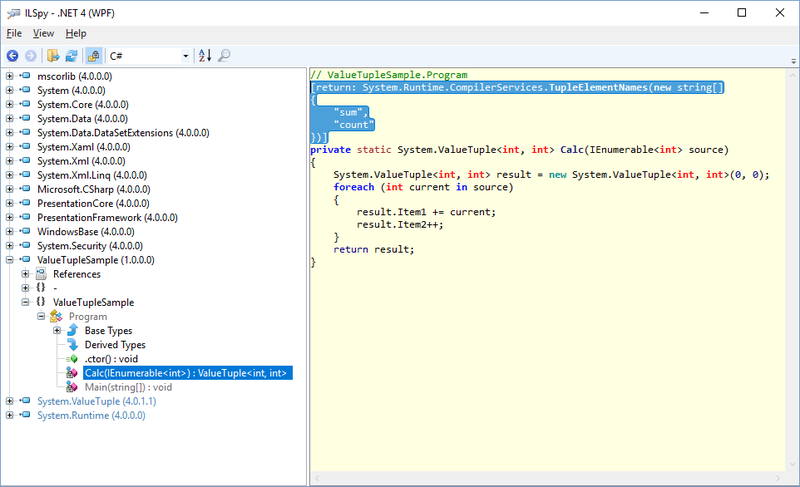 As you can see, the field names of value tuples basically become the part of .NET assembly metadata. And they will stay there disclosing the private implementation details to the outside world even when you build the assembly in Release configuration. Starting with version 5.6, Eazfuscator.NET fully understands the semantics implied by value tuples and takes care to automatically prune the unused value tuple metadata, including the aforementioned field names. Such transformation is a win not only in terms of security, but it also saves bandwidth bringing faster startup performance during runtime.